Holy Crap! How Did Anyone Survive This Explosive Audi Crash? At first, when Douglas's dad woke him up around 3:00 am to say there was a crash outside their house in suburban Vancouver, it wasn't a shock. More than a dozen cars have ended up in their lawn over the last twenty years. The shock didn't come until Douglas saw the flaming Audi A7 split in half and roasting in a massive fire, then saw the driver sitting on the ground next to it. How could anyone survive this wreck? 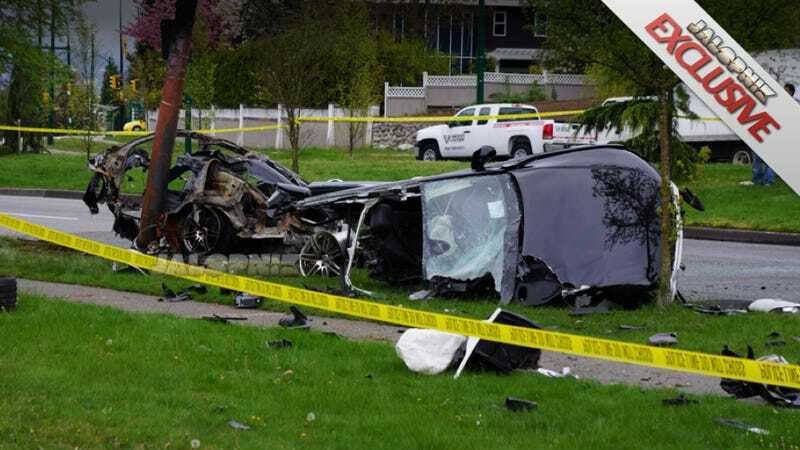 The street outside Douglas's home became an Audi bonfire in the early hours of Saturday morning when a driver went speeding out of control entering the curve on Cambie Street, sending the luxury sedan into a pole, splitting the car in half. "The vehicle he [the driver] was travelling in went diagonally through a pole from the front passenger side to the rear driver side," Vancouver Police Cst. Jeff Shell told local news radio. "Within about an inch or two inches, he would have been hit by the pole and probably would have killed himself. If anybody else had been in the vehicle, they would have been dead." Not surprisingly, alcohol and speeding are assumed to be involved. "When I got outside, the car was already ablaze," Douglas told Jalopnik. "Some taxi drivers had pulled the driver to safety just before it erupted. The car was on fire for a good 10 minutes before the fire trucks or police showed up. All the while the Audi was melting and exploding its guts onto the road. The driver was later taken away by ambulances but had only minor injuries." Judging pictures of gnarly car crashes is sort of an occupational hazard around here, so it's with some authority that we say this is the worst car crash we've seen someone survive in five years (probably since this). Drinking and speeding is bad enough, but the unnamed driver made the extra mistake of picking one of the worst places in Vancouver to do so. Our reader's house happens to be on the right side of a sweeping corner that's slightly off-camber. In the last 20 years they've lost three fire hydrants, had a '90s Civic hatchback nearly run into the house upside down, witnessed a BMW 3-Series leave a differential in their rock garden, and experienced a Ford van drop its contents onto the street. It's kind of a great/terrible place to live if you love cars.